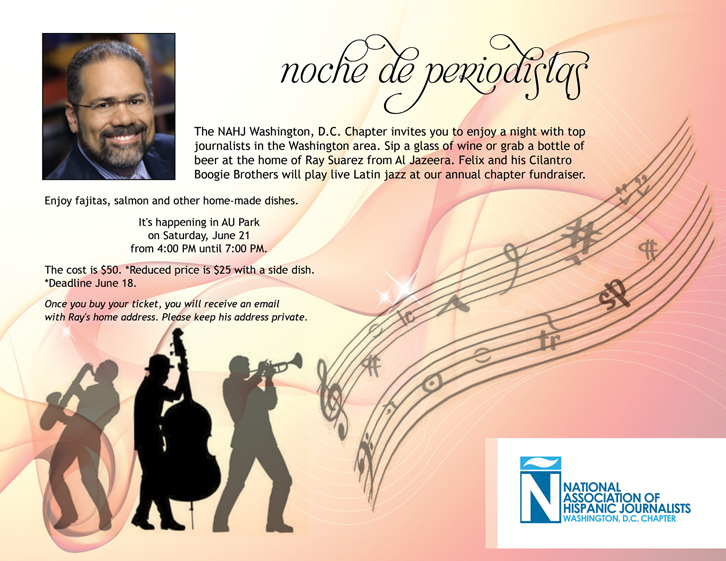 Make plans now to join us for our annual chapter fundraiser, Noche de Periodistas. Ray Suarez from Al Jazeera is hosting our event at his home in the AU Park neighborhood in the District. Come listen to Felix and his Cilantro Boogie Brothers play Latin Jazz. We’re grilling fajitas and salmon. It’s happening Saturday, June 21 from 4:00 PM to 7:00 PM. We will have a live auction. The cost is $50. *The reduced price is $25 if you bring a side dish. The deadline to buy tickets for the reduce price is June 18th. Once you buy your ticket, you will receive an email with Ray’s home address. We ask that you keep his address private. This is our only chapter fundraiser each year. We do not charge a membership fee. So we need your help to make our fundraiser a success. The money from the fundraiser will go to the chapter account. We use the money for chapter activities including: convention assistance, the Charlie Ericksen Internship Supplement, and other projects. Our chapter does not receive any funding from the national association.